At our regularly scheduled SCL-CAC meeting of January 8, 2015, County Public Works representatives made a presentation under Item C. 6 of our agenda on the above subject matter indicating that they are now planning to include Sunshine Canyon Landfill in the disposal plan but only after it was excluded from the FEIR which was approved by the County Board of Supervisors on November 12, 2014. The Board voted to oppose the plan (read the letter). Food processors, dairies and others in Kern County may soon have a new place to send their organic waste — and with it, a new source of renewable, compressed natural gas. This month, two state agencies awarded grants totaling $8 million to help fund construction of a $25-million biogas digester outside Tulare believed to be the first commercial-scale project of its kind in the Central Valley. Newport Beach-based Colony Energy Partners’ project would take in a total of 500 tons per day of material such as food waste, yard trimmings, fats and even cow manure. It would come from any facility or municipality between Bakersfield and Modesto. The 18-acre plant proposed near Paige Avenue would heat up the mixture to produce transportation-grade methane equivalent to more than 5,000 gallons of diesel fuel per day for commercial and municipal vehicle fleets. Leftover solids could serve as a soil amendment. Colony says the project, expected to begin operation by the end of next year, offers three primary benefits: reduced emissions of methane, a potent greenhouse gas; less waste diverted to landfills and additional renewable transportation fuel. “Think of us like a landfill,” said Kent Hawkins, Colony’s managing partner. He added the company is in negotiations with haulers, food processors and other companies that would pay Colony to take their organic waste. CalRecycle contributed $3 million to the project last week, and on Wednesday the California Energy Commission added $5 million. The commission estimates the project will produce about 400 million cubic feet of renewable biomethane per year. It said the digester would cut greenhouse gas emissions by 41,850 metric tons per year, while reducing nitrous oxides by more than 35 tons per year. In a written statement Thursday, Commission Chairman Robert B. Weisenmiller said the agency’s grant award is intended to promote greater use of alternative and renewable fuels. Since July, Colony has processed food waste at a Fresno plant handling up to 30 tons per day. The company has also proposed a liquid natural gas facility near Reno, Nev. If the Tulare project takes off as expected, Hawkins said, its capacity could be doubled to process 1,000 tons of organic waste per day. Please click on the link to view the lastest issue of Inside Solid Waste. As the following notice indicates, if you experience odor issues during this period, you should report them. It is important that you do not assume that all odor issues between June 23 and July 3, 2014 are caused by this testing. Indeed, 500+ trucks arrive daily to deposit 7,500 – 8,000 tons per day of stinking trash, adding over 2,000,000 tons per year to the landfill, in an on-going odor problem which has not be resolved by the City, County or State since 2008. The SCAQMD and its hotline 1-800-CUT-SMOG (1-800-288-7664) is the official agency for recording these odor complaints, and for issuing Notices of Violations (NOV). 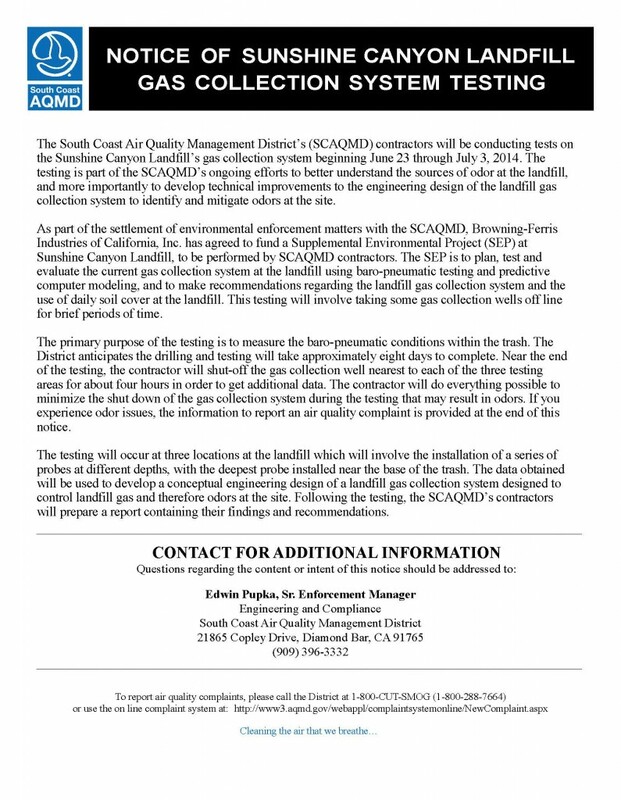 As always, it will be up to the SCAQMD Inspectors to determine if the odors that you report are from the daily operations, the outgassing of odor laden methane from previously deposited trash, or from the testing itself. Please click on the link to view the latest issue of Inside Solid Waste. As you are aware, members of the community filed a class action lawsuit against Sunshine Canyon Landfill. The AQMD is not a party to the lawsuit, however the Landfill’s counsel subpoenaed the contact information of individuals who have filed complaints with the District. The District fought the production of that information, except for the complainants who are named as plaintiffs in the lawsuit, who in theory have already disclosed their identity. The superior court judge did not agree with the District’s arguments and ordered production of the complainant identifying information to be provided to a third party to send out an “opt-out” notice, where if the individual does not “opt-out”, the plaintiffs’ and defendants’ counsel will receive their contact information limited to use in the lawsuit. The District filed a writ before the court of appeals to challenge the trial court’s decision, which we just found out was denied. I wanted to personally alert you to the possibility that members of the community who have complained to the District, may be receiving “opt-out” notices which requires them to affirmatively notify the third party mailer that they do not want their identifying contact information released. Please do not hesitate to contact me directly if you have any questions or require additional information. I don’t anticipate any notices being sent until next month at the earliest. Response to the March 25, 2014 Notice of Violation.